Scott Inbinder, a representative of the firm which bought Evanston Plaza about a year ago, spoke with Evanston Patch columnist Christine Wolf who organized an online petition to introduce a bowling alley operator into the plaza. 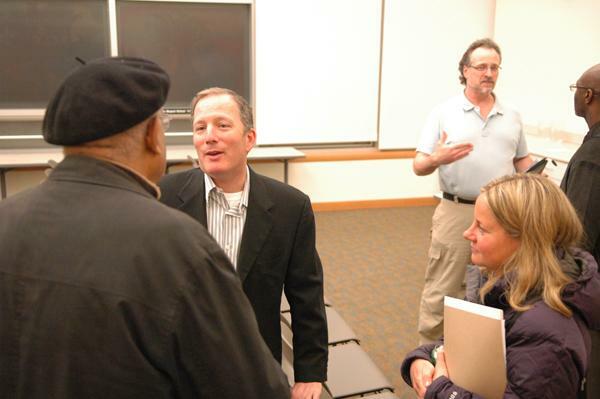 A representative from the developer of Evanston Plaza discussed plans to revitalize the property during his first meeting with west Evanston residents Thursday night. Scott Inbinder of Bonnie Management Corporation accepted the invitation to a 2nd Ward meeting at the Joseph E. Hill Education Center, where he talked about revitalizing the property at 1968 Dempster St., which the company purchased out of foreclosure about a year ago. Inbinder did not attend a March ward meeting to which he was invited. During the meeting, Inbinder addressed the possibility of introducing a bowling alley to the plaza. In February, Evanston Patch columnist Christine Wolf started an online petition for a bowling venue in the area that has attracted about 400 signatures. Wolf said she is pleased with Inbinder’s willingness to speak with the residents. The lingering effects of the recession have made it difficult to attract tenants to fill vacant lots in the plaza, which is currently dominated by the grocery store Dominick’s, Inbinder said. He stressed introducing businesses to the area takes time. “We are talking to everyone out there … but it has only been a year, and this center has had a pretty checkered past,” Inbinder said. Although the city plans to provide the investment firm $20 million spread out over 23 years in tax increment financing district funds, Inbinder said the agreement with the city was not contractually binding. Instead, the company plans to fund development projects privately and turn to the city for help after it has attracted a “quality tenant” or “can’t make economics work,” Inbinder told The Daily. The firm, however, has already dipped into some of the $2 million in initial TIF funding approved by the City Council in June, which is separate from the $20 million funding. The company plans to use the funds to repaint store facades and perform canopy work, Inbinder said. The investment firm would prefer to attract more tenants and cater to their development preferences before spending money on redeveloping the plaza, Inbinder said. “We really didn’t want to spend money twice … (we) don’t know what the tenants might want,” Inbinder said. So far, Evanston Plaza has attracted a Papa Romeo’s Pizza restaurant, an Armed Forces recruiting center, a DaVita dialysis center and a pediatrician’s office. Wolf expressed optimism in the plaza’s future. “I do think things are going to ramp up now,” she said.